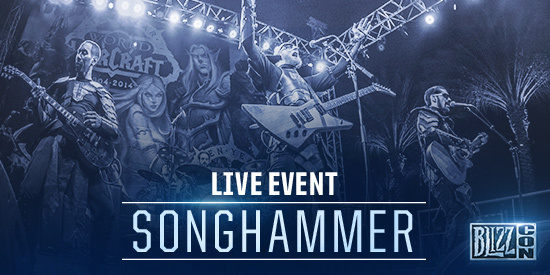 Songhammer will be Performing at BlizzCon 2016 for the Blizzard 25th Anniversary Celebration! TeamSkunk Community Members, Songhammer, will be performing at BlizzCon 2016 for the Blizzard 25th Anniversary Celebration! ALL the faces shall be melted!!!! 25 years ago, a small group of gamers set out to create the kinds of game experiences they loved playing—and Blizzard Entertainment was born. Since then, the team at Blizzard has transported millions of people around the world to fantastic worlds of fantasy and science fiction—including Diablo’s Sanctuary, which first invited players to descend into the terrifying labyrinth beneath the Tristram Cathedral 20 years ago in 1996! Please join us in celebrating these anniversaries on Friday, November 4 from 8 p.m. until 10 p.m. in the Grand Plaza outside the Anaheim Convention Center during BlizzCon 2016. This event is open to everyone, whether you’re attending the convention or just happen to be in the neighborhood, and admission is free. We’ll also have some great food, special anniversary-themed drinks, entertainment—and even a surprise or two. The main stage at the celebration will feature BlizzCon Talent Contest winners Songhammerperforming live—so grab some armor from your closet and get ready for an epic rock show. Open space between Marriott and Hilton outside BlizzCon—no BlizzCon ticket required! You’ll be celebrating the occasion alongside a fun-filled crowd of game developers, staff, and a swarm of fellow Blizzard gamers. You won’t want to miss a moment of this special event—we can’t wait to see you there!